The ancient Chinese regarded the sword as a very important weapon, as evidenced by the relatively large number of documents about it and the frequency with which swords turn up in archeological digs. It is the only weapon that has been used and admired continuously from the beginning of Chinese history to the present day. Over time, the sword has evolved from a short, wide copper weapon to a long, slim steel one, a result of gradual improvements in metallurgy over thousands of years. The techniques for using the sword have also evolved with the changes in structure and quality. The short, wide copper blade would not hold an edge and was soft so that it could be used only at short range to hack and stab. Bronze is brittle, as is cast iron. Therefore, blades made of these materials would break easily when they were used for blocking. The longer the sword, the longer the effective fighting range, so the full array of fundamental techniques in use today were only made possible with the discovery of hardened, tempered steel. The number of fundamental techniques increased significantly from a very few with the early short, wide swords to more than thirty in use today. Swords differed from one dynasty to another, in terms of shape, handle style, and sheath decoration. The changes came about not only because of developments in metallurgy but also because of the influence of other cultures, particularly those of the invaders of China: the Mongolians (蒙古人), Manchurians (滿州人), Tibetans (西藏人), and Himalayans (喜馬拉亞人). China has in turn been a major influence on the cultures of nearby regions, such as Korea, Japan, and Indo-China. For example, the Japanese samurai sword may have been imported originally from China during the Tang dynasty (唐朝) (AD 618–907), as well as many other weapons, which are similar in appearance to those of Tang China. The Chinese of 3000 to 4000 BC, like other prehistoric societies, probably used the sticks and stones that lay about them to settle their disputes. Not until the time of the first recorded emperor, Huang Di (黃帝) (2697–2597 BC), called the "Yellow Emperor" because he ruled the territory near the Yellow River, does evidence exist for weapons made of something other than stone. Huang Di had swords made of jade, copper, and gold. This period, therefore, marks the beginning of the metallurgical science in arms manufacturing in China. Knowledge of Huang Di's weapons comes from discoveries near Zhuo Lu (涿鹿) of knives and swords, remnants of ancient battles between the emperor's forces and those of Chi Yu (蚩尤). By the time of the Shang dynasty (商朝) (1766–1122 BC), swords made of copper alloys were in use. Bronze ushered in this era, but by its close, iron was being used. The Zhou dynasty (周朝) (909–255 BC) replaced the Shang, following fierce warfare. Both emperors demanded better swords and in this way stimulated advances in metallurgy, although naturally the emphasis was on finding alloys for stronger swords. As the power of the Zhou dynasty diminished and the emperor's control weakened, China was thrust into a series of civil wars. This time is known as the Spring and Autumn Period (Chun Qiu, 春秋) (722–484 BC) and the Warring States Period (Zhan Guo, 戰 國) (403–222 BC). Each of the many warring factions strove to produce stronger and sharper weapons than before, and sword makers of the day were held in the highest regard. Three of the most famous sword makers of that period were Ou Ye Zi (歐冶子), Gan Jiang (干將), and Mo Xie (莫邪)Ou Ye Zi forged two very famous swords, Ju Que (巨闕) and Zhan Lu (湛盧). It is said that these swords were so sharp that if they were dipped in water, they would be withdrawn perfectly dry. Gan Jiang and Mo Xie were husband and wife, and forged two swords that bore their names. After Zhou, the Qin dynasty began (秦朝) (255–206 BC). When the emperor Qin Shi Huang (秦始皇) (221–209 BC) took power, he heard that the Wu Emperor (吳) He Lu (闔閭) had collected tens of thousands of swords from all over China, and had them buried with him when he died. Three hundred years later Emperor Qin Shi Huang ordered his men to find the swords. After many years of searching and digging, the emperor had only a large hole for his efforts. Eventually, the pit filled with water and came to be known as the Sword Pond (劍池) in Suzhou (蘇州). During the Han dynasty (漢朝) (6 BC–AD 220), the process of alloying iron instead of copper was first described in the book Huai Nan's Thousand Crafts (Huai Nan Wan Hua Shu, 淮南萬華術), a volume on metallurgy. The Three Kingdoms Period followed (San Guo, 三國) (AD 220–280). 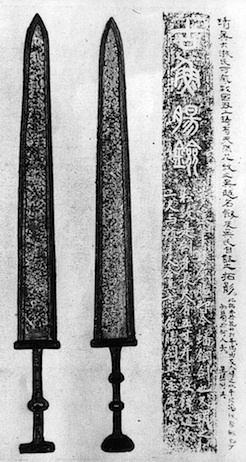 The famous Cao-Cao (曹操) is reputed to have had swords that could cut iron as if it were mud. There is a story about his rival, Liu Bei (劉備), that illustrates the effect of tempered iron swords. Liu, as a descendant of the Han imperial family, felt he had the duty to reunite China. To do this he occupied Shu (蜀) in western China, also called Sichuan Province (四川省), and began preparing his army for war. To recruit the best fighters, he often held and presided over contests, and one day two fighters stepped forward, one with an iron rod, the other with a saber. During the fight, the rod wielder knocked down the saber man and brought his rod down to finish the fight. Everyone present was amazed when the iron rod broke in two as it was blocked by the saber. The maker of that saber, Pu Yuan (浦元), was found and immediately commissioned to forge weapons for Liu Bei. From the Three Kingdoms Period to the Northern Zhou dynasty (Bei Zhou, 北周) (AD 557–581), little is known about the weapons used, although copper is considered to have been the predominant metal in use during this time. The Sui and Tang dynasties (隋、唐) (AD 581–907) are the brightest and most peaceful eras in Chinese history. Famous scholars, poets, and other artists flourished, while the arts of war were not demanded. In AD 907, the country was once again divided, this time into five parts, known as the Five Dynasties (Wu Dai, 五代) (AD 907–960). They were later reunited in the Song dynasty (宋朝) (AD 960–1280). The Song ended with the invasion of the Mongols (the Jin race, 金), who founded the Yuan dynasty (元朝) (AD 1206–1368). This mixing of cultures resulted in more changes in sword styles. In AD 1368 the Mongols were defeated by the Chinese, and the Ming dynasty (明朝) (AD 1368–1644) began. Then the Manchurians invaded and formed the Qing dynasty (清朝) (AD 1644–1911). During these later dynasties, steel and other alloys were used to make swords, which were longer than ever. There were three places during the Qing dynasty that became famous for the quality of their weapons. Two are in Zhejiang Province (浙江省) in eastern China: Long Quan (龍泉) and Wu Kang (武 康). The other is Qin Yang (沁陽) in Henan Province (河南省), the site of the Shaolin Temple (少林寺). These places attracted great sword makers because of the quality of their water. No one was sure why the water was superior, but the great arms forged in Long Quan for centuries were attributed to its superior qualities. In the eighteenth century, firearms were introduced into China, and further development of the sword as a martial weapon ceased. Consequently, swords and other weapons used for martial arts study remain in the style of the Ming and Qing dynasties.